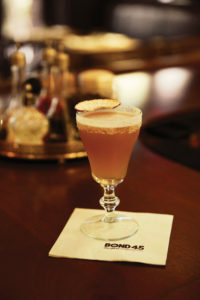 Wesley Taylor and Lilli Cooper are drinking cocktails at Bond 45, the reinvented theater district restaurant that launched its new location in November. Sitting at the upstairs bar, the SpongeBob SquarePants stars trade notes on three winter cocktails, crafted by resident bartender David Jovic. “I’m not really a cocktail girl,” says Taylor, who plays the mischievous and evil Plankton in the Nickelodeon musical. The Irish Coffee is his drink of choice: “It’s rich, it’s full-bodied.” Cooper giggles as Taylor puts on his erudite airs. “Stop it! I am sophisticated,” he retorts. Cooper plays Sandy Cheeks, the pal and potential love interest of the show’s titular hero. 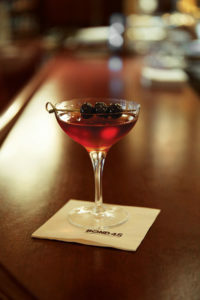 She is a fan of the Bon Accord, which offers a twist on the standard Manhattan. “It’s my new favorite,” she says. As for the Almost a Toddy, Cooper calls it “the perfect fall drink.” “These are our interpretations of classic American cocktails,” Jovic notes. 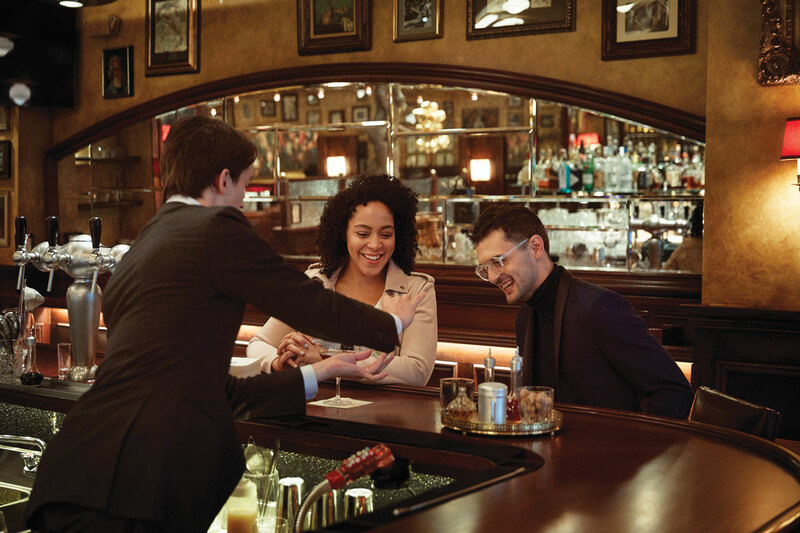 The Palace Theatre, where SpongeBob is running, is right around the corner from Bond 45, and Taylor and Cooper can’t wait to spend post-show evenings at the bar. Shake all ingredients and double-strain into a sugar-rimmed toddy glass. Garnish with three dried apple slices. Add all ingredients to a mixing glass, except for absinthe and lemon zest. Stir over a 1×1 cube for 20 seconds. Strain into a toddy glass, spray absinthe over the drink, and zest with lemon. Pour 3 oz. of fresh cream in a shaker and shake for 7-8 seconds. Fill a toddy glass with hot water and set aside. Muddle the sugar cube in the Irish whiskey. Discard the hot water, and pour the ingredients in the glass. Add freshly brewed coffee and slowly float the cream to top of the drink. 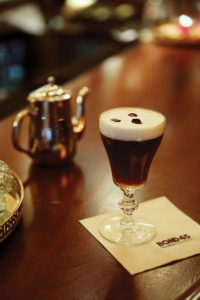 Garnish with three coffee beans. Get tix from $49 to SpongeBob SquarePants!